rec. Konzerthaus der Abtei Marienmünster, Germany, 22-24 July 2014. I must admit that I am not a fan of transcriptions and much prefer to hear music in its original form. However, I enjoy the works of the three composers featured on this disc so any chance to hear their music performed is a boon. Carl Reinecke studied with Mendelssohn, Schumann and Liszt and was the musical director of the Gewandhaus Orchestra in Leipzig between 1860-1895. There he gave many premiere performances including that of Brahms’s Deutsches Requiem. He was also a great teacher, with the list of his students reading like a composers' "Who’s Who" of late nineteenth century and early twentieth century. Musically he is primarily remembered for his Flute Sonata “Undine”, although he composed in most genres including operas, symphonies, concertos, solo instrument and five string quartets. The Trio is an attractive four movement work with an almost humorous Scherzo second movement. This arrangement rather heightens the humour. I have been interested in Heinrich von Herzogenberg for a while now and have managed to accumulate some very interesting discs, mainly on CPO. Born in Graz in Austria in 1843, Herzogenberg’s music, like that of Reinecke, is also romantic in nature. Regarded as a great teacher he it was who advised Vaughan Williams to study with Bruch. His Trio is also in four contrasting movements, and whilst I would love to hear this work with an oboe instead of a trumpet, this transcription works well. The Ballade by the English composer, York Bowen, fares less well. This instrumental combination doesn’t suit the music as well as it does the previous two pieces. Maybe this is due to the multi-faceted form of this single movement work. 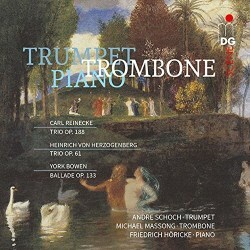 I feel that the trumpet fails to hit the spot in the slower more delicate sections. This is no fault of the performers, as their playing is, as with the previous two works, excellent. The oboe would however be a much better match. Beautifully balanced and natural sound is a plus of this disc as are the booklet notes.